Got people in the cheap seats? Want to record your presentation with multiple angles? 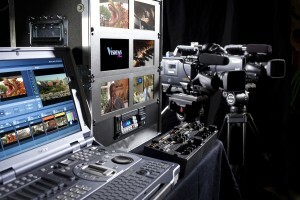 No problem, with our Multi-Camera FlyPack we can direct multiple cameras that can be projected on your large screens. Now everyone at your event will have a front row seat. We can webcast your event for the people who can’t attend the show. Great crew, lots of experience. Our crew has been working together for a really long time. Collectively, we’ve done thousands of shows ranging from single camera switched together with PowerPoint to six cameras switched with PowerPoint, multiple playbacks and projected to multiple screens and webcast. Over the years, we have encountered many curveballs that can happen during a live event. Back-up plans are always in place. No matter the situation, we make the show successfully happen. Call us now and see what Visions Plus brings to the party.